Last week's crash of a Russian cargo spacecraft could delay the first-ever private mission to the International Space Station, according to NASA officials. Space Exploration Technologies — better known as SpaceX — is planning to launch its Dragon capsule toward the orbiting lab on Nov. 30, with a historic docking slated for nine days later. 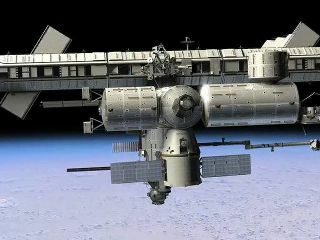 But as a result of the Aug. 24 crash of the unmanned Russian Progress 44 supply ship, there might not be any astronauts aboard the station to receive Dragon in early December. If that's the case, Dragon's launch would have to be postponed, officials said. An unmanned International Space Station? But no Soyuz rockets or spacecraft will fly until Russian engineers fix the issue that caused last week's failure. Russian space officials said Monday (Aug. 29) that the malfunction appeared to be related to a problem with a gas generator in the rocket's third stage, according to a Russian ITAR-TASS news service report. If Russia doesn't return its rockets to flight by mid-November, the station could be left unmanned for the first time since 2000. That's because the six astronauts currently residing on the orbiting lab are due to come home relatively soon. Three are slated to return next month, and the rest will likely depart by Nov. 19 at the latest, NASA officials announced Monday (Aug. 29). So most questions about Dragon's upcoming mission will have to wait until the Soyuz situation is sorted out. "If we're not flying Soyuz by the middle of November, that's sort of a moot point, because we won't have any crew on orbit to do the capture" of Dragon, Mike Suffredini, NASA's space station program manager, told reporters Monday. He added that six astronauts would not be required to welcome Dragon to the station; three could handle the job. The scheduled Nov. 30 flight will mark Dragon's second and final unmanned orbital test flight. It's a demonstration mission under NASA's Commercial Orbital Transportation Services (COTS) program, which aims to encourage the development of private cargo-carrying craft to fill the gap left by the retirement of the space shuttle fleet. On that flight, Dragon zipped around the Earth twice and splashed down in the Pacific Ocean. On its next mission, the capsule will actually dock with the space station and perhaps even offload some supplies. "This next mission represents a huge milestone not only for SpaceX, but also for NASA and the U.S. space program," SpaceX officials wrote in a recent status update. "When the astronauts stationed on the ISS open the hatch and enter the Dragon spacecraft for the first time, it will mark the beginning of a new era in space travel." If Dragon's second demonstration mission is a success, fully operational re-supply missions with the capsule could begin as early as three or four months later, SpaceX officials have said. NASA and SpaceX might still hit their original timelines. The Russians appear to making progress on their investigation of the Soyuz anomaly, Suffredini said. "Right now, I think they would tell you they're cautiously optimistic that they'll keep the ISS manned at least to three crew," Suffredini said. Doing so, he added, would mean "you were able to fly at least one Soyuz between now and the middle of November."